The first market will be on Saturday, 18th May in the Civic Centre Car Park, 25 Ferres Boulevard, South Morang. There will then be further markets on the 3rd Saturday of each month until the end of the year, at which time its success or otherwise will be evaluated. If you would like to become a stallholder, contact Randa Almushcab by phone (9217 2367) or email. Newsletter reader Vasundra Kandpal is starting to give vegan cooking classes in Eltham under the banner ‘Flavorful Health’. Her first classes are about cooking with grains, legumes, flours & spices and are taking place on Wednesday, 10th April at 11am-1pm, and on Sunday, 14th April at 11am-1pm. 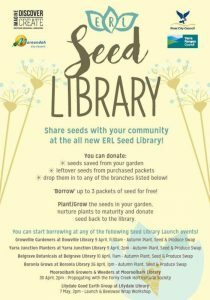 Eastern Regional Libraries are setting up a seed library which you can either take from or contribute to. The participating libraries include Mooroolbark and Lilydale. Courtesy of 3000acres: Jessamy Miller, from Northcote. There is now a page on our website which links to all the video interviews of food gardeners from North East Melbourne. Do you have a problem with weeds? Steam Weeds (aka Kieran Foley) is an ‘eco weed management company’ based in Whittlesea. They would like to use their steam weeding technology to help you get rid of your weeds. If interested, contact Kieran by phone (0484 694482) or email. 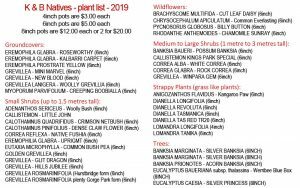 Gardeners with excess tomatoes are invited to give them to one of the not-for profit organisations listed below who will, in turn, preserve them as passata, chutney, sundried or dell’olio and then distribute through their food relief programs. The program runs from 4th to 17th April. DIVRS in Preston or STREAT in Collingwood. K&B Natives (Whittlesea): a small, family-run, nursery who sell their native plants at both Eltham Farmers’ Market (1st and 3rd Sundays) and St Andrews Market. They will be at Eltham Farmers’ Market this upcoming Sunday. Pictured is their plant list. Kuranga Native Nursery (Mount Evelyn): the largest range of Australian native plants in Victoria. 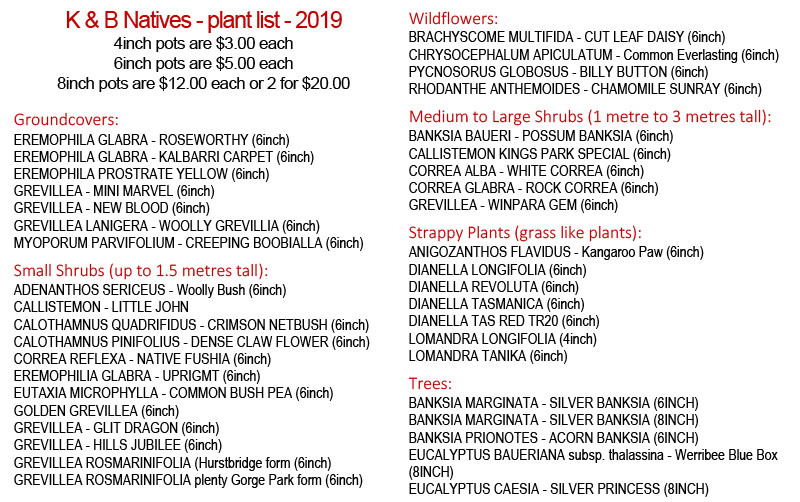 Bulleen Art & Garden: the only local nursery I’m aware of where you can place orders for plants that they don’t have in stock. Which link was clicked most times in the last newsletter? The video of Guy Palmer being interviewed in his garden. What do you drink with the Queen of England? Royal-Tea. The festival is being held on the first three weekends in May. There are 9 garden tours (see below) and 10 workshops (see next section). Each event is $10 ($5 concession). A calendar of all the events is on our website. Monique’s rental abundance garden: Sunday, 5th May, 3-4pm; Northcote. What: Monique’s rental garden features fruit trees, veggie growing and chickens, all with a permaculture focus. The household puts an emphasis on eating and trading what they grow, as well as saving seeds for use the next season. With Monique’s experience as a market gardener, the space is productive and demonstrates that, even if you’re a renter, growing food is possible. In this tour, Monique will share her knowledge about taking crops from seed to table, crop rotation, how to apply market garden lessons to the backyard, and permaculture principles for the home and garden. Damian’s biodiverse permaculture garden : Saturday, 11th May, 10-11am; Reservoir. What: Damian has been practicing permaculture since he attended a talk by permaculture co-founder Bill Mollison in 1977. He is also involved in replanting native vegetation on Herring Island in inner suburban Melbourne. What permaculture and bush regeneration have in common is that they both aim to establish biodiversity whether building up microbes in the soil, integrating chooks and fruit trees or attracting wildlife to the garden. The complex mix of species forms mutually beneficial relationships, all performing multiple functions such as nutrient cycling, pollination or pest control. Damian’s garden reflects his love of growing food for both humans and local native species. Lee’s generous sharing garden: Saturday, 11th May, 11.30am-12.30pm; Reservoir. What: Lee has created a bountiful garden in her social housing estate using mainly recycled materials, and generously shares her surplus harvest, saved seeds and garden knowledge with her neighbours, friends, and local community. She demonstrates how gardening can be affordable and accessible to everyone. Her garden features a wide range of fruit and vegetables, herbs and is also a haven for native bees and worms with a bee hotel and compost area. Sharing homegrown food with Luigi and Emanuela: Saturday, 11th May, 1-2pm; Reservoir. What: From the moment you arrive, your gregarious and hospitable hosts Luigi and Emanuela will entertain you with gardening and food preserving knowledge and stories as they showcase their abundant Mediterranean inspired garden. Features include intensively cultivated vegetable beds, a home built hothouse, food preserving area and backyard pizza oven. Guided tour of the Plummery: Sunday, 12th May, 12.45-1.45pm; Northcote. What: Kat Lavers’ urban permaculture system, The Plummery, is a 280 square metre block which produces almost all the household’s herbs, veggies, fruit and eggs (428kg in 2018) while using only 46 litres of mains water per person and 3.9 kilowatt hours of electricity per day. Kat is a garden farmer, permaculture designer and facilitator, and will discuss how she manages her system. Robbie’s aquaponics garden: Sunday, 12th May, 3-4pm; Thornbury. What: Robbie’s front and back yards are both devoted to food production, and feature two aquaponics systems in which trout and vegetables are grown in a mutually dependent relationship, enabling both to thrive. One system is homemade while the other is a purchased kit, and both are seamlessly incorporated into rest of the garden, which produces a huge variety of vegetables and herbs. Composting and free-range chickens also contribute to this garden’s sustainability credentials. Maya’s fruitful garden: Saturday, 18th May, 3.30-4.30pm; Preston. What: Maya has created an edible garden that is as beautiful as it is fruitful. Decorative, productive hedges are formed from an extensive range of pruned and grafted fruit trees using a combination of espalier, cordon, ‘Bouche Thomas’ and dwarfing rootstock to create intriguing shapes and patterns. The garden features 32 apple trees of several varieties, cane and bush berries, persimmons, cherry guavas, feijoas and citrus. Mature grape vines are trained against the house, helping cool it in summer and yielding summer grapes. Maya practices organic and biodynamic gardening methods using recycled rain water and extensive composting systems. A netted chicken fence protects the rear garden from striking ‘Araucana’ chickens, originally bred in South America, who are kept as much for their wonderfully friendly nature as for their pale blue eggs. Harry’s micro orchard garden: Sunday, 19th May, 10-11am; Northcote. What: Harry is passionate about gardening in small spaces and has been lovingly tending his fully organic micro orchard garden for 14 years. At 72 square metres, this garden demonstrates that you don’t need a large plot of land to grow a wide variety of fruits and vegetables. Harry planned, constructed and planted the garden with his daughter to encourage science concepts through organic gardening. Clever grafting methods yield citruses, apples, pomegranates and stone fruits. The all year rotation of herbs and seasonal vegetables supplement the food requirements for a family of five. Lena’s courtyard and garden: Sunday, 19th May, 1.30-2.30pm; Thornbury. What: Lena has a permaculture-inspired garden in her 40 square metre courtyard, the aim being fill this space with as many productive plants as possible whilst attracting bees and other beneficial insects. A fascination for making the best of small spaces for gardening motivates this project, and Lena will provide tips to maximise production and small space gardening resources. Re-localisation of food production, the facilitation of social connection, the rethinking of the economy of consumption and improved care for the natural environment have become a prism through which Lena’s decisions are made in all aspects of life. Intro to gardening workshops with DIVRS: Saturday, 4th May, 1.30-3pm; Preston. garden is a vegetable and fruit garden that specialises in growing fresh food for DIVRS’ emergency food relief efforts. Their volunteers will guide you through a hands on workshop on composting and worm farms, propagating seedlings, good soil management and planting techniques. 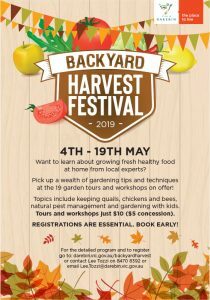 You will also learn about the new DIVRS ‘Veg Squad’ program that supports local school kitchen gardens, community gardens and Darebin householders to grow food for both themselves and for Darebin residents experiencing food insecurity. All participants will take home a complimentary punnet of seedlings. Organic backyard chook keeping with Jessamy Miller: Sunday, 5th May, 10-11.30am; Northcote. 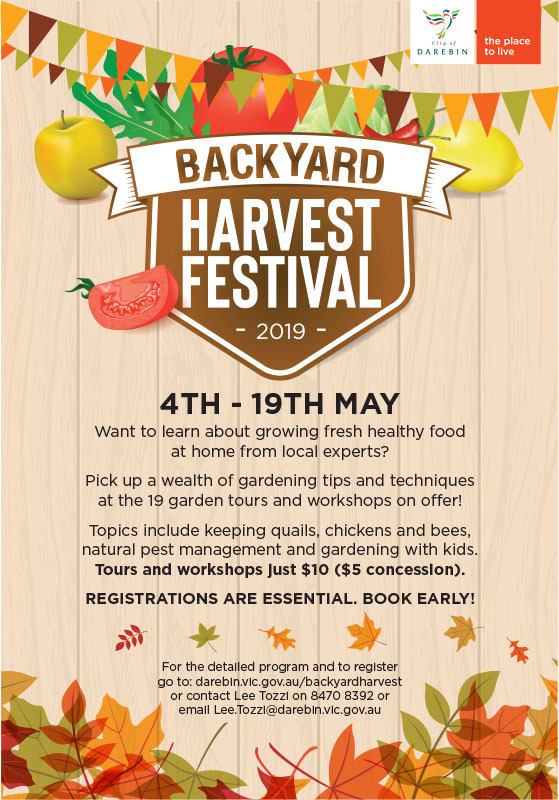 What: In this workshop, ABC Organic Gardener writer Jessamy Miller will focus on keeping chooks in a suburban environment as well as introduce you to her own flock. You will learn how to build an ideal home for chooks to protect them from weather and potential predators and what to feed your chooks to keep them healthy and productive. Lastly, Jessamy will cover chicken first aid and how to ensure you meet local council requirements with your flock. Backyard bees 101 workshop: Sunday, 5th May, 1-2.30pm; Preston. What: Backyard beekeeper Morgan Koegel will introduce you to her hive and teach you what you need to know to get started on a beekeeping journey. Morgan will talk about the time and cost commitment, the requirements of keeping bees in an urban environment, and what you can expect from your bees. You’ll have the opportunity to check out Morgan’s bee set-up and equipment, as well as taste some of her honey. Productive gardening with kids workshop at Poppy’s Patch: Saturday, 11th May, 2.30-4pm; Reservoir. What: Poppy’s Patch started as a father/daughter project when Poppy was aged three and the family decided to use the space on the front lawn to start an edible garden – to not only grow food but teach her where food comes from. To save back-breaking work, they used the no-dig approach so that Poppy could directly layer it herself and learn about how soil is managed. This has helped transform rock-hard northern suburb clay soil into a rich organic loamy soil full of life and nutrients. More recent additions to the garden include multiple compost bins, worm farms and backyard chickens. To ensure Poppy can meaningfully participate in the garden, her father Chad has developed strategies for her to work independently. In this workshop, Chad will share these strategies with a focus on making productive gardening meaningful for kids, and the rest of the family. Backyard quails workshop: Sunday, 12th May, 10-11am; Northcote. What: You will meet Kat Lavers’ covey of quails. You will learn all about quail care including housing, feeding and how they can work to support a garden system. Kat Lavers is a garden farmer, permaculture designer and facilitator whose 280 square metre block produces almost all the household’s herbs, veggies, fruit and eggs (428kg in 2018!) while using only 46 litres of mains water per person and 3.9 kilowatt hours of electricity per day. Natural pest management workshop: Sunday, 12th May, 11.30am-12.30pm; Northcote. What: Kat Lavers will explain natural pest management techniques relying on permaculture principles. You will have the opportunity to explore these techniques in practice in Kat’s permaculture garden which features fruit trees, intensive vegetable growing and quails. Kat Lavers is a garden farmer, permaculture designer and facilitator whose 280 square metre block produces almost all the household’s herbs, veggies, fruit and eggs (428kg in 2018!) while using only 46 litres of mains water per person and 3.9 kilowatt hours of electricity per day. Native bee workshop for kids and families: Saturday, 18th May, 10-11am; Preston. What: Katrina Forstner, founder of Buzz and Dig, will introduce your family to native bees, pollination and increasing urban biodiversity. This session aims to bring joy and wonder to children in as they discover insect biodiversity and urban sustainability on a micro level in the garden. Nurturing a sense of respect and excitement to living creatures, whilst learning about the important role bees have to play, enables us to grow healthy food. Attendees will make a bee-friendly hotel with natural and recycled materials to take home. Participants are asked to bring a 400ml empty recycled tin can (to make a bee hotel). Native bee workshop for adults: Saturday, 18th May, 11.30am-12.30pm; Preston. What: Katrina Forstner, founder of Buzz and Dig, will introduce you to the amazing world of native bees and how to attract them into your garden as pollinators for flowers and edibles. This workshop will demonstrate methods for pollination and planning for bee habitat, including bee-attracting plants and how to encourage urban biodiversity. You will learn about the co-evolution of bees and flowering plants, what common native bees look like, and native bee nesting behaviours and more. You will also get to make a bee hotel using natural and recycled materials to take home. Participants are asked to bring a 400ml empty recycled tin can (to make a bee hotel) and a pair of secateurs (if possible). Fruit tree maintenance and pruning workshop: Saturday, 18th May, 2-3pm; Preston. What: Maya’s garden includes 32 apples, persimmons, cherry guavas, feijoas and citrus. Using grafting and pruning techniques, she has created an edible hedge of her fruit trees with a combination of espalier, cordon and other interesting shapes. In this session, Maya will introduce you to the needs of different fruit trees and guide you on pruning and maintenance techniques for shape, health and fruit. Citrus and apple tree propagating workshop with Harry Kalathas: Sunday, 19th May, 11.30am-12.30pm; Northcote. What: There is nothing more satisfying than propagating your own plants. In this workshop, Harry will demonstrate two propagating techniques for citrus and apple trees: basic aerial layering and grafting. You will gain an understanding of the tools and equipment and seasonal timing requirements for each technique as well as how to take care of grafts and propagated plants during their initial growing period. Make sense of food labels: Monday, 29th April, 9.30-11.30am; Eltham. What: Tour a supermarket and learn how to accurately read and understand food labels and choose healthy foods that are suitable for the whole family. You will also receive a healthy shopping guide booklet. The tours are led by healthAbility’s qualified dietitian and are open to anyone interested in healthy eating. Bookings: by phone (9430 9100). Tomato troubleshooting – grow better tomatoes: Tuesday, 30th April, 7-8pm; Coburg Library. What: Karen Sutherland, co-author of Tomato – know, sow, grow, feast, will discuss ways to improve next year’s tomato harvest by learning from this year. She will talk about common pest and disease problems and solutions, as well as some simple preserving ideas. Growing food in small spaces: Saturday, 4th May, 10.30-11.30am; Fitzroy. What: Want to grow some fresh fruit, vegetables or herbs for your kitchen but feel like you don’t have the space? Poppy Turbiak will cover the tips and tricks to make your space more productive – even if all you have is a small courtyard or balcony. She will talk about growing food in containers, plants that thrive in different light conditions, and the best plant choices to get you going now. Lakeside Good Earth Group – seed library launch and beeswax wraps: Tuesday, 7th May, 2-3.30pm; Lilydale Library. 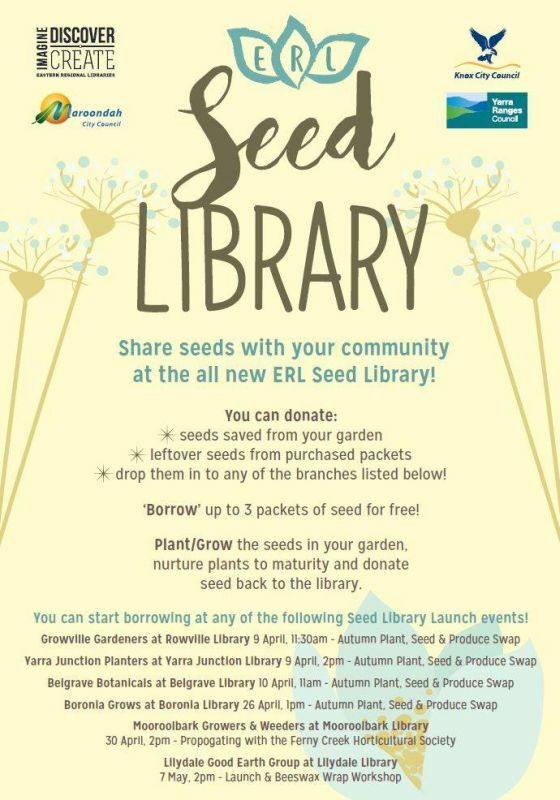 What: They will launch the Eastern Regional Libraries Seed Library – a place to share free seeds among gardeners at their local library. Sharon will then show you how to make eco-friendly beeswax and soy wax wraps. These cotton wraps are re-usable, functional, economical and easy to make at home. Home composting and worm farming: Thursday, 9th May, 10.30am-midday; Thomastown Library. What: Learn how to set up a worm farm and its environmental benefits. Cook Indian by the creek: Friday, 5th April, 6-8pm; Diamond Creek. What: Menu: chicken biryani with mixed veg raita (spiced yogurt) and chicken. Cook Indian by the creek came into existence with the idea of breaking the myth that Indian cooking is complex and difficult to nail. In each session, they will share their traditional recipes and go through the step by step cooking process. The classes are held in a private kitchen. Flavorful Health cooking class: two occurrences – Wednesday, 10th April and Sunday, 14th April, both 11am-1pm; Eltham. What: Learn ways to work with varieties of grains, legumes and flours that you might not even know exist. Learn about 10 spices and ways to use them. Discover time saving, easy and quick recipes. You will also learn eco-friendly methods of cooking that will help you to reduce your gas/electricity usage. Kids in the kitchen: Thursday, 11th April, 11am-1.30pm; Panton Hill. What: Facilitated by Kerry Meredith from Under The Pickle Tree. Get your kids cooking these school holidays. On the menu is a dish everyone loves that is actually quite time-consuming and intense to cook. But don’t worry, with lots of preparation and by learning to master the wok, your child can cook up a chicken pad thai in no time! Add to that a fresh Thai cucumber pickle and a lime spritzer and lunch is served. Cook Indian by the creek: Friday, 26th April, 6-7.45pm; Diamond Creek. What: Menu (vegan savoury): onion bhaji and chick peas pancake + chutney. Cook Indian by the creek came into existence with the idea of breaking the myth that Indian cooking is complex and difficult to nail. In each session, they will share their traditional recipes and go through the step by step cooking process. The classes are held in a private kitchen. Gluten free, grain free and wheat free workshop (thermomix): Saturday, 27th April, 2-4pm; Chirnside Park. What: This will be an interactive hands on look at how to enjoy baked goods if you are gluten, grain and wheat free. They will be doing 6 dishes, all of which you will be able to sample. Cook Indian by the creek: Friday, 3rd May, 6-7.30pm; Diamond Creek. What: Menu: malai kofta. Cook Indian by the creek came into existence with the idea of breaking the myth that Indian cooking is complex and difficult to nail. In each session, they will share their traditional recipes and go through the step by step cooking process. The classes are held in a private kitchen. Cook Indian by the creek: Friday, 10th May, 6-7.30pm; Diamond Creek. What: Menu: chicken saagwala / palak paneer + spiced rice. Cook Indian by the creek came into existence with the idea of breaking the myth that Indian cooking is complex and difficult to nail. In each session, they will share their traditional recipes and go through the step by step cooking process. The classes are held in a private kitchen. Healthy eating 7and nutrition: Wednesday, 3rd April; Eltham Living & Learning. Moreland grows – local food exhibition: Thursday, 4th April, 5.30-6.30pm; Coburg North. Moreland local food networking and Autumn celebration: Thursday, 4th April, 6.30-8pm; Coburg North. Produce in pots: Thursday, 4th April, 6.30-9pm; Bulleen Art and Garden. The joy of backyard chooks: Saturday, 6th April, 9.30am-12.30pm; Bulleen Art and Garden. The eclectic garden (garden tour): Saturday, 6th April, 10am-4.30pm; Nunawading. Bee hive tour: Saturday, 6th April, 10.30am-12.30pm; Rivers of Yarrambat. Open Farm Day: Sunday, 7th April, 10am-4pm; Nillumbik. The eclectic garden (garden tour): Sunday, 7th April, 10am-4.30pm; Nunawading. Pruning fruit trees with Karen from Edible Eden: Wednesday, 10th April, 6.30-9pm; Forest Hill. How to grow Winter Asian vegetables: Wednesday, 10th April, 7.30-10pm; Doncaster Garden Club. Native plant and book sale: Saturday, 13th April, 10am-4pm; Eltham Senior Citizens. Good garden bugs: Saturday, 13th April, 1-4pm; Watsonia Library. Autumn Gin Market: Sunday, 14th April, 11am-8.30pm; The Craft & Co, Collingwood. Gardening with kids: Tuesday, 16th April, 10-11.30am; Bulleen Art and Garden. What if changing what you eat could improve brain function? : Tuesday, 16th April, 7-8.30pm; Hawthorn Library. Retro Suburbia Group: Wednesday, 17th April, 6.30-8.30pm; Lalor Library. Beeswax wraps: Thursday, 18th April, 11am-midday; Diamond Valley Library. Beginners compost, worm farm and bokashi: Wednesday, 24th April, 10-11.30am; Central Ringwood Community Centre. Edible weeds walk: Saturday, 27th April, 11am-1pm; Brunswick East. Edible weeds walk: Saturday, 27th April, 2-4pm; Brunswick East. Beekeeping basics: Monday, 29th April, 7-8.15pm; Ivanhoe Library. Creating retrosuburbia in your garden: Tuesday, 30th April, 6-8pm; Ivanhoe Library. Cooking for healthy minds (8 sessions): Tuesdays from 30th April to 18th June (8 weeks), 1.30-3.30pm; Thornbury. Pruning fruit trees with Karen from Edible Eden part two: Wednesday, 1st May, 6.30-9pm; Forest Hill. Maltese Easter sweets: Thursday, 4th April, 6.30-7.30pm; Coburg Library. Cooking master class – ‘curry nights’: Thursday, 4th April, 7-9pm; Gourmet Living, Templestowe. 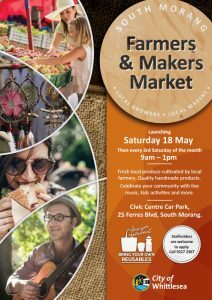 Mozzarella and ricotta cheesemaking workshop: Saturday, 5th April, 10am-12.30pm; Bee Sustainable, Brunswick East. Easter chocolate novelties: Friday, 5th April, 2-3pm; Watsonia Library. Mozzarella and ricotta cheesemaking workshop: Saturday, 6th April, 9-11.30am; Bee Sustainable, Brunswick East. No Waste Cook Club: Saturday, 6th April, 10am-midday; Fitzroy North. Kombucha workshop: Saturday, 6th April, 11am-midday; Collingwood Library. Miso paste making: Saturday, 6th April, 11am-1.30pm; Preston. Shio koji making and cooking: Sunday, 7th April, 11am-1.30pm; Preston. A touch of Thai (vegan cooking class): Sunday, 7th April, midday-4pm; The Beet Retreat, Smiths Gully. Easter fun chocolate decorating: Wednesday, 10th April, 10.30-11am; Eastland, Ringwood. Flavorful Health cooking class: Wednesday, 10th April, 11am-1pm; Eltham. Cacao, cocoa and chocolate: Thursday, 11th April, 6.30-7.30pm; Eastland, Ringwood. Cooking master class – ‘satay night’: Thursday, 11th April, 7-9pm; Gourmet Living, Templestowe. Nuka zuke – rice bran pickling: Saturday, 13th April, 11am-1pm; Preston. Flavorful Health cooking class: Sunday, 14th April, 11am-1pm; Eltham. Thai inspired vegan cooking class: Sunday, 14th April, midday-4pm; The Beet Retreat, Smiths Gully. Make your own smash Easter egg: Wednesday, 17th April, 10.30-11.30am; Eastland, Ringwood. Toastie press sesh – kitchen hacks and tasty tips: Wednesday, 17th April, 6-9pm; Kathleen Syme Library, Carlton. Ganache and truffles – let’s play! : Thursday, 18th April, 6.30-7.30pm; Eastland, Ringwood. Vegan brunch cooking class: Monday 22nd April, midday-4pm; The Beet Retreat, Smiths Gully. Cooking for all abilities (10 sessions): Tuesdays from 23rd April to 25th June (10 weeks), 10am-12.30pm; Thornbury. Vegan brunch cooking class: Thursday, 25th April, midday-4pm; The Beet Retreat, Smiths Gully. Preserving workshop: Saturday, 27th April, 2-4.30pm; Central Ringwood Community Centre. Cookie cake and fondant cookies with Emelia Jackson: Wednesday, 1st May, 7-9pm; Gourmet Living, Templestowe. View the complete calendar of upcoming events.